Final English Championship results . Congratulations to everyone involved throughout the campaign. So very many things are extremely tight, often depending on those non-counting runners making a vital contribution. A lot to live up to next year, and the more people the better, getting to these races. The rules for the British insist on listing only those completing the required full set of races, whereas for the English, the total points gained, even from 3 races, is the rule. On the FRA website all points recipients are listed. I've just put out those in the top 10 positions. 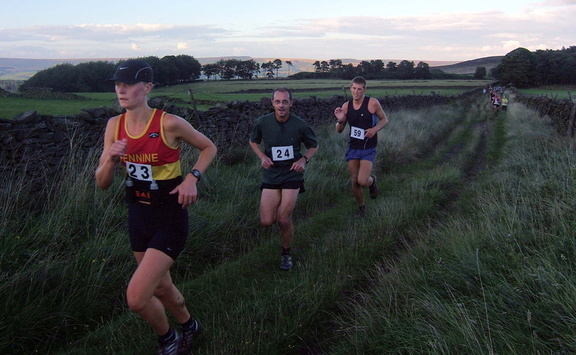 Senior Men - 1st : M40 - 2nd : M50 - 1st : Senior Ladies - 4th : LV40 - 1st..
Senior Men:- Up the Nab (U) : Black Combe (B) : Langdale (L) : Pendle 3Peaks (P). Medalists:- Rhys (U) : Matt Elkington (U) : Neil(U) : Tom Saville (U) : Stuart Bond (U) : Kris (B) : Tom Brunt (B) : Johnny Crickmore (L) : Josh (L) : Will (L) : Rob (P). M40:- Up the Nab (U) : Black Combe (B): Langdale (L) : Borrowdale (Bo). Medallists:- Tom Brunt (U): Spyke (U) : John Hunt (U) : Gareth (U) : Dave Taylor (B) : Mike Nolan (B) : Jon Morgan (L) : Mike Robinson (Bo) : Dave Sykes(Bo). M50:- Up the Nab (U) : Black Combe (B) : Langdale (L) : Sedbergh (S). L40:- Up the Nab (U) : Pendle (P) : Borrowdale : Langdale (L). Medallists :- Judith (U) : Nicky (U) : Helen (U) : Jenny (L) : Nicola (L). MU23:- Matt - 1st : Tom - 2nd. Senior Men :- Rhys - 6th= . M50:- Spyke - 2nd : Dave Taylor - 7th : Steve Bell - 8th. W40 - Judith - 5th : Nicky - 7th : Helen - 8th : Nicola - 10th=. W45 - Judith - 1st= : Nicky - 5th : Nicola - 7th.